I got tagged by Ashtyn from Just AG to do the AG Q&A Tag! Thanks so much Ashlyn! I'm really excited since I don't get the spotlight very often on ADU, so I hope you enjoy getting to know me better! I'll be doing it in my room! I'm usually pretty busy since I cook and do dishes in my family, so when I get some free time I usually ether spend it in here or with my sisters. 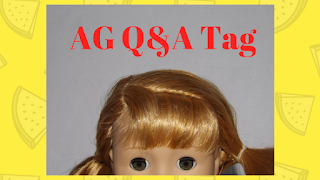 Create your own AG Q&A Tag button (I'm assume that means the banner, which I made). If you don’t know how, you can skip this step. Thank and give a link to the blog of the person that nominated you. Nominate 3-5 other AG doll bloggers. Come up with at least five questions for the dolls that you nominate. You can include your questions on your post, or send them to your nominees. Do not ask any personal or inappropriate questions. Have your doll that was nominated answer the questions given. List these rules on your blog post. Ok, let's answer some questions!!! 1. If you could meet any Beforever doll, who would you meet? Answer: Hmmmm, well most of my sisters are Historical/Beforever since that's Katie's favorite line of dolls, I'm a Beforever myself! I'll go with..... Melody. 2. Favorite style of music? 3. What's the most annoying thing your human does to you? Answer: Oh my goodness she puts me in that horrid travel bag with Molly when she takes me places! Have you ever tried being in a cramped space with that doll for long periods of time?! "Then Wu hit the bridge and bamboo went flying, and he built a cage around Garmadon, everyone gasped!" "But get this, Zane gasped too, but he actually said the word "Gasp" because he's a robot! Isn't that hilarious?!" Answer: Like I said before, I'm pretty old fashioned. I like wearing 50's outfits that are pretty, yet comfortable. My poodle skirt is definitely my favorite though. 5. Would you say you are more of a tom-boy or a girly-girl? Answer: Oh that's hard, I think I'm a girly-girl, although I do love going outside and exploring! That was so fun! Thanks again to the amazing Ashtyn for nominating me! Claire from Life of a Farm Doll! Melody from A Doll-op of AG! Del from Delightful World of Dolls! And here are some questions for you guys to answer..
1. Which one of your sisters do you not always get along with? And why? 2. Do you have any doll friends outside of your family? 3. What's something your human does that annoys you? 4. What's your favorite movie? 5. What's your most favorite toy that you own? I hope you all have fun with the tag! I absolutely can't wait to read your answers! Until next time my friends, bye! P.S. Doll Notebook is having a giveaway! Jewel will be giving away a beautiful 18" doll dress, so totally enter for your chance to win! Good luck everyone! Yay! I loved the part with Molly, and that moment in the movie was so funny. Thank you so much for sharing, Katie! LOL thank you! Haha yes! That part of the movie was awesome! I actually came across the Gag reel for ninjago yesterday and at one point Zane told a joke and he literally said "Laugh out loud!" Instead of actually laughing. Jay and Kai looked really uncomfortable when he did that XD no problem, I hope lots of people enter! Oh yes I've seen that many times! I love it! Have you seen the Lego Batman movie one? They also have one for the lego movie. Awesome! Isn't it so funny? I actually haven't seen that one yet, I had found that video too but it's been so crazy with ballet intensive that I haven't gotten to watch it yet XD oh yeah! The Lego movie one is hilarious! That's my favorite part too!!! Barbra is just like "Batman..."
Maryellen, you did awesome! Thank you so much for nominating Kanani, she is so excited! You totally deserve 10000000000! You have an amazing blog! Aaah this was so much fun! Thanks again, Maryellen! Yay! You're welcome! I'm going over to read your post right now! Thank you so much, Maryellen! AHHHHHHH THAT MOVIE IS THE BEST!!! I KNOW IT WAS AWESOME! Thank you for the nomination, Melody can't wait to do this! Congrats on 25 followers and here's to many more! Maryellen is so cute! I really want to get her. Thanks so much for nominating Claire! Aww thanks! Oh cool, you totally should! She's a beautiful doll and her hair is a gorgeous color :) you're welcome <3 I know I've said this to everyone I nominated but I can't wait to see her answers! P.s. If was nice to see you have the spotlight for a while!